Is your idea of the perfect vacation relaxing in a beautiful secluded place, surrounded by nature but close to activities the whole family can enjoy? 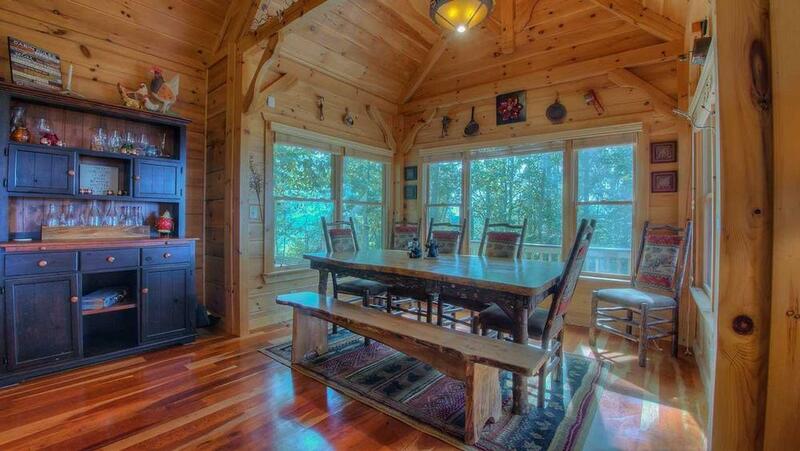 The Blue Ridge, GA cabin rental Sunshine Mountain offers that and so much more. 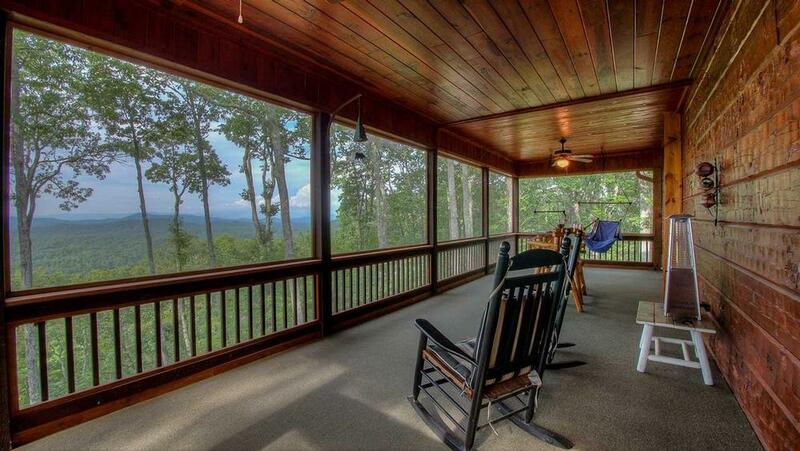 Located on a mountaintop in Mineral Bluff, this lofty retreat boasts breathtaking 360-degree views from its wraparound decks, screened-in porches and every window. You can watch the sun kiss the mountains in the morning as the fog rolls off the valleys below you, and revel in the beauty of the sunsets and millions of stars at night as you feel the stresses of everyday life melt away. Nature surrounds you at every turn, even right outside the door: deer come to visit every day to be fed. 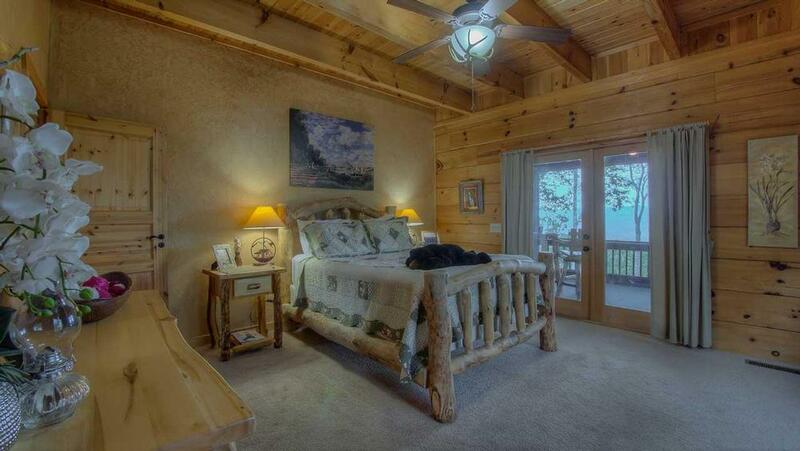 Featured in Log Home Living magazine in December 2009, Sunshine Mountain is spectacular inside and out, boasting unique architectural details and professionally decorated with high-end furnishings throughout. 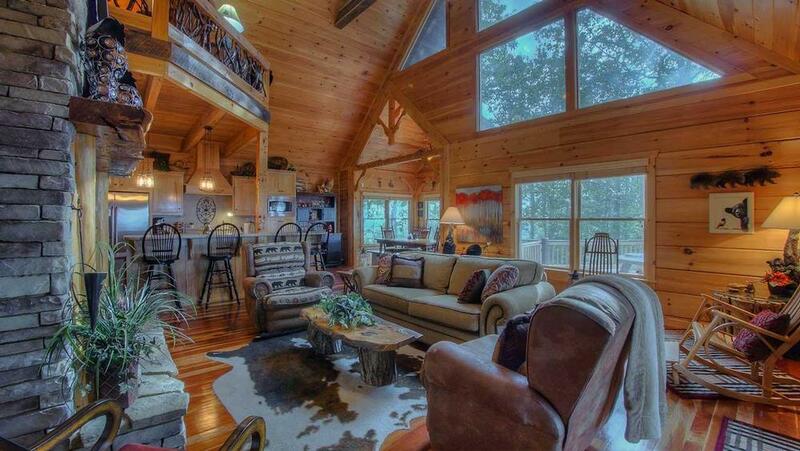 Its massive hand-carved logs, vaulted ceilings, two-story stone fireplace, cherry hardwood floors and laurel branch spindles give it character, and its rustic furniture and designer lighting envelop you in comfort. 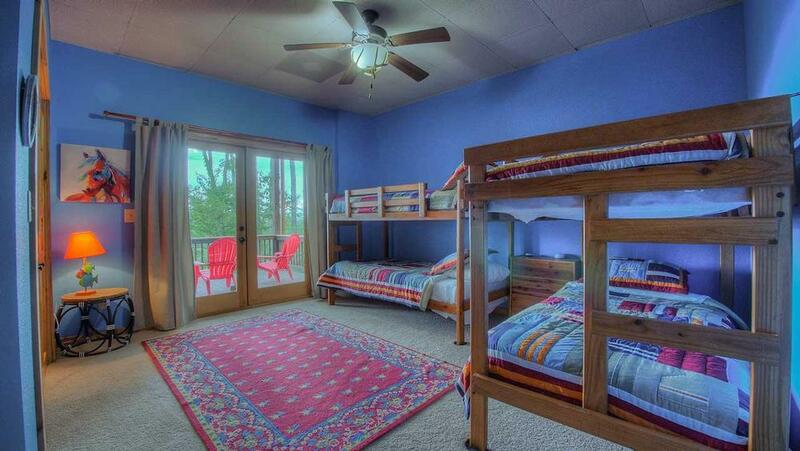 Speaking of which, you’ll slumber in blissful comfort in each of the cabin’s four bedrooms, one of which has a pair of twin bunk beds, perfect for teens and kids. 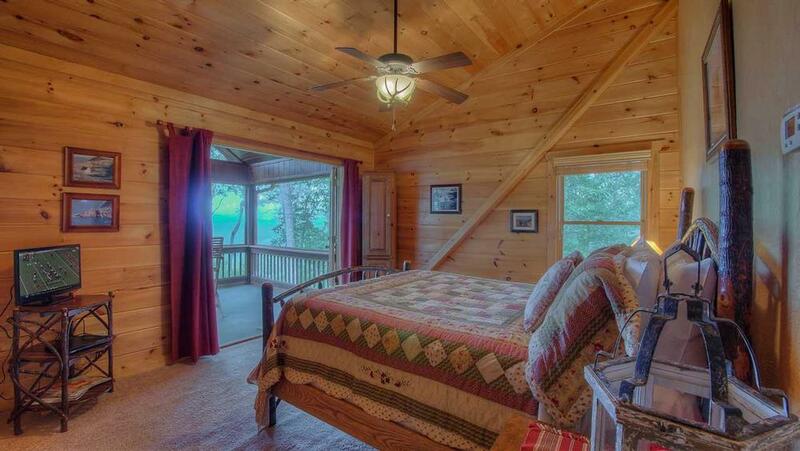 The other three feature queen beds, flat screen TVs with DVD players, ceiling fans and beautiful patchwork quilts. 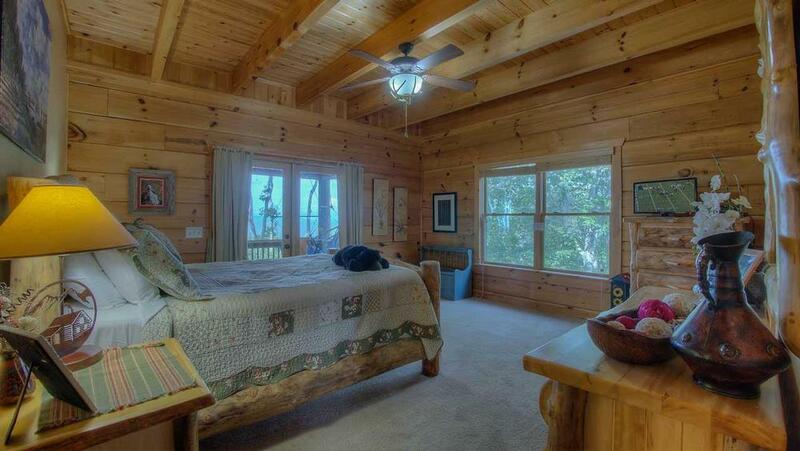 The master bedroom has log furniture, a spacious closet, a balcony and bathroom with double sinks, double shower, and sitting bench. 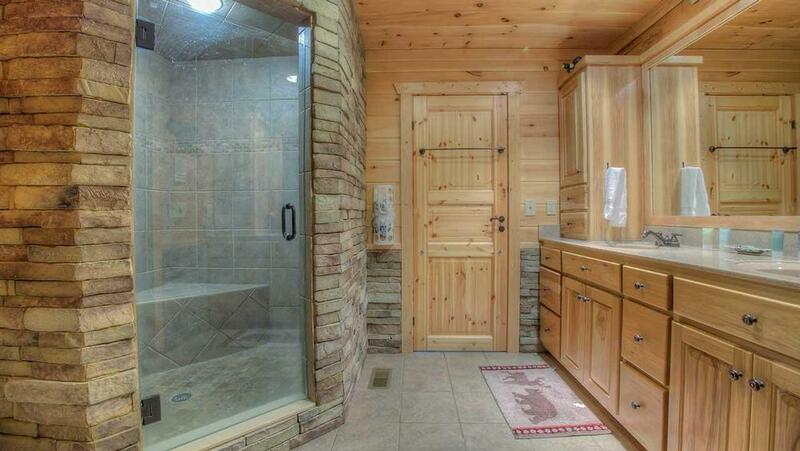 The upstairs and downstairs bathrooms feature tub/shower, and there’s a powder room on the main floor. 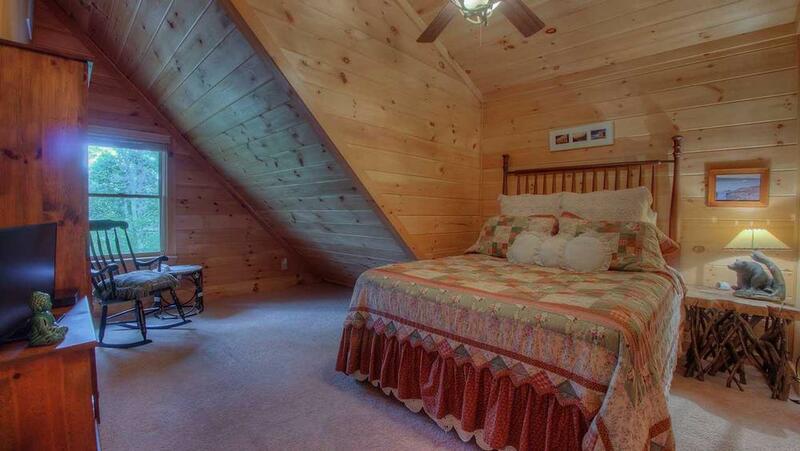 Need extra sleeping space? 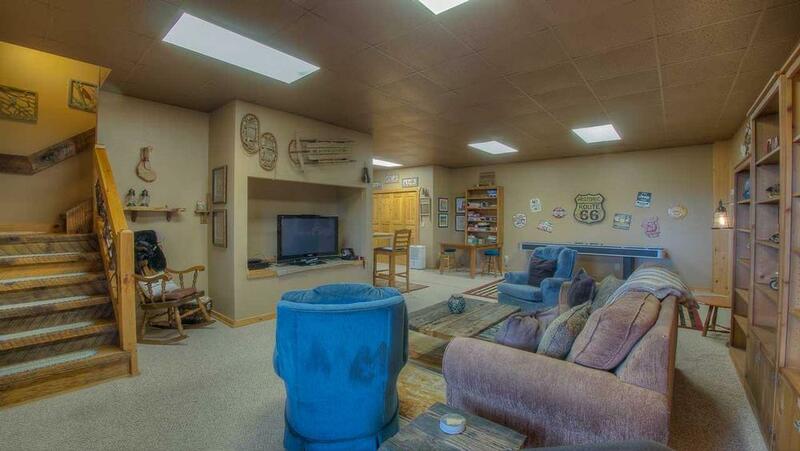 No problem: there’s a pullout sofa in the basement big enough for two. 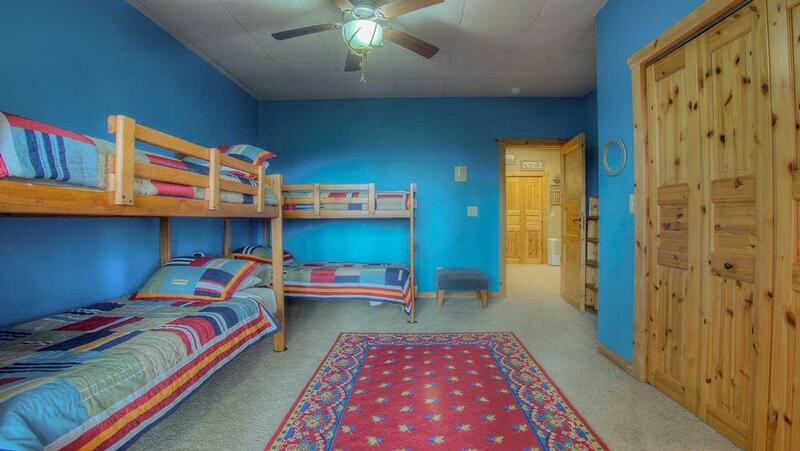 That downstairs room is geared toward socializing and entertainment, with a large flat screen TV, DVD and Wii, and plenty of games and movies for your enjoyment. There’s also a shuffleboard table, electronic dartboard, board games, card table, and exercise machine in the game room. 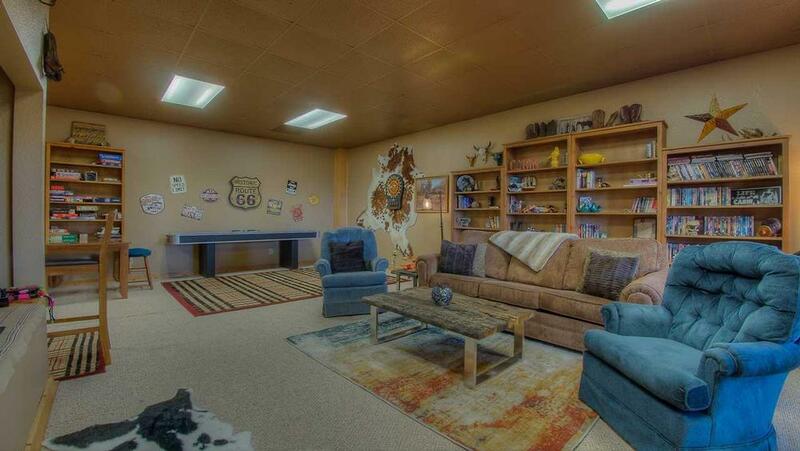 Upstairs in the main living room, you can sit back in the sofa, recliners, or rocking chairs before the fireplace in a room made more cozy and atmospheric by rustic accents like carved bear lamps and a faux cowhide rug. 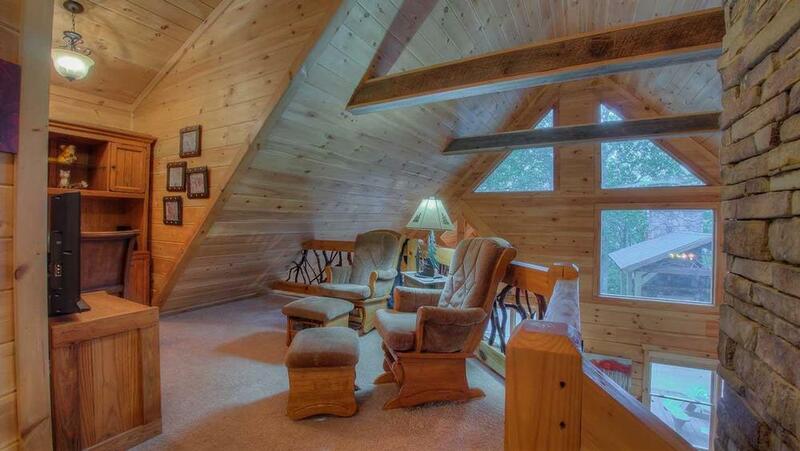 Take the stairs up to the loft and you’ll find a flat screen TV/DVD, two gliders and an office desk. 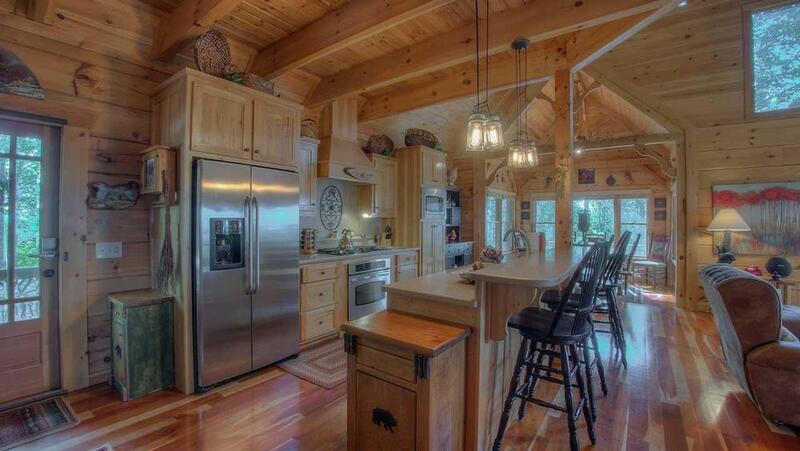 The cabin is also wired for the Internet and has an intercom system. 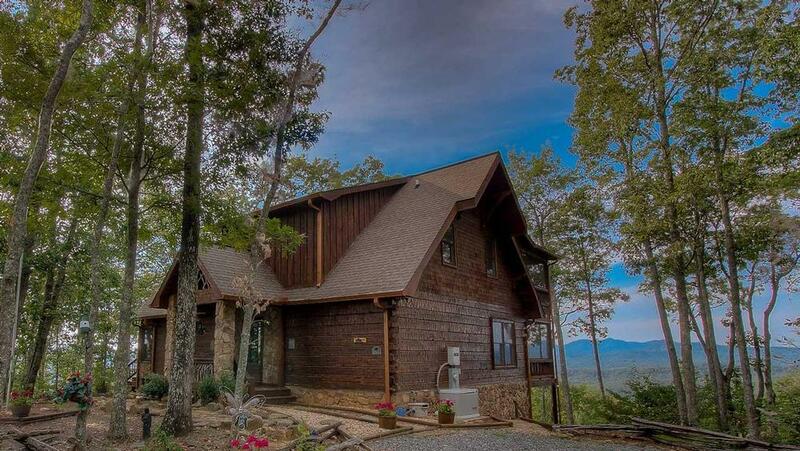 Sunshine Mountain has everything you need to prepare gourmet meals, as the kitchen is fully stocked with stainless steel appliances, two coffee makers (drip and Keurig-style), griddle, waffle iron, Magic Bullet, toaster and toaster oven, and a crockpot. 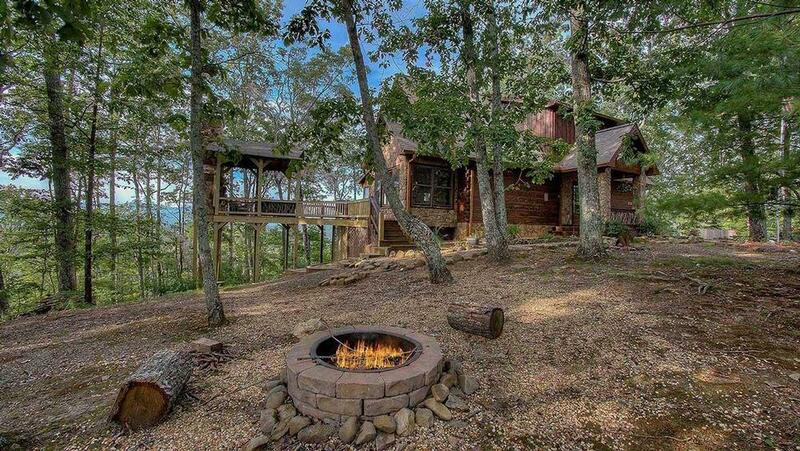 You’ll also find a trash compacter, Amazon Echo sound system, and a carving of a woodland fairy on a support beam above the island, crafted by a local artist. 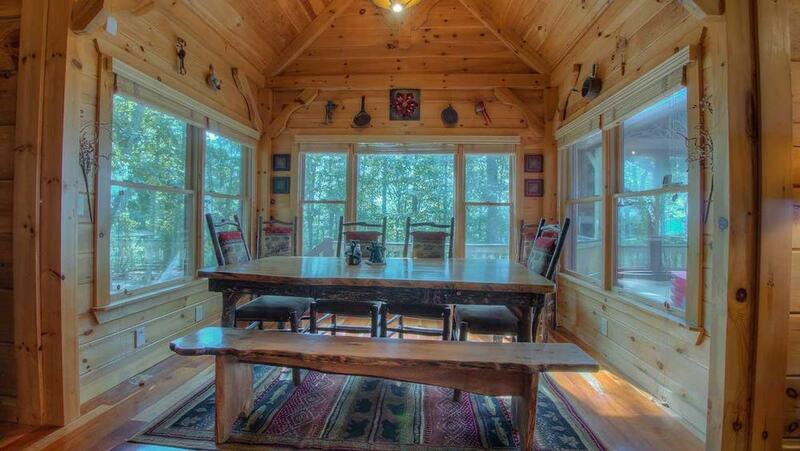 There’s seating for ten at the dining table, plus space for four at the breakfast bar. 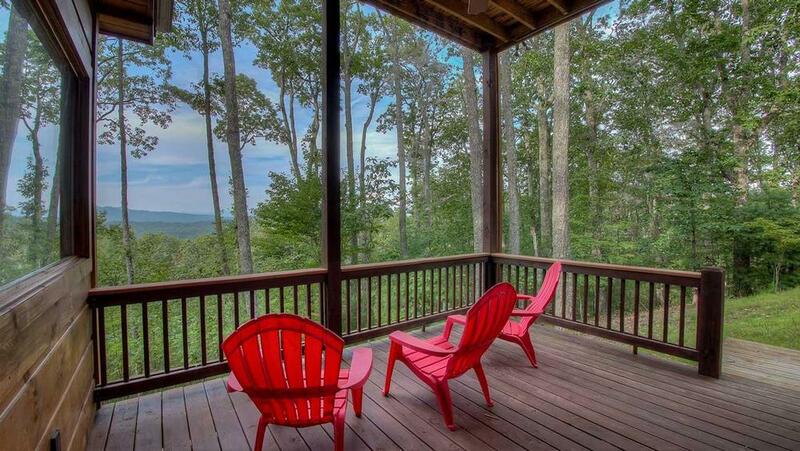 You’ll find ample seating outdoors, too, in the porches off the living room and master bedroom, upstairs, the basement and the side of the cabin, where the hot tub provides you with awesome mountain views as you soak your cares away. 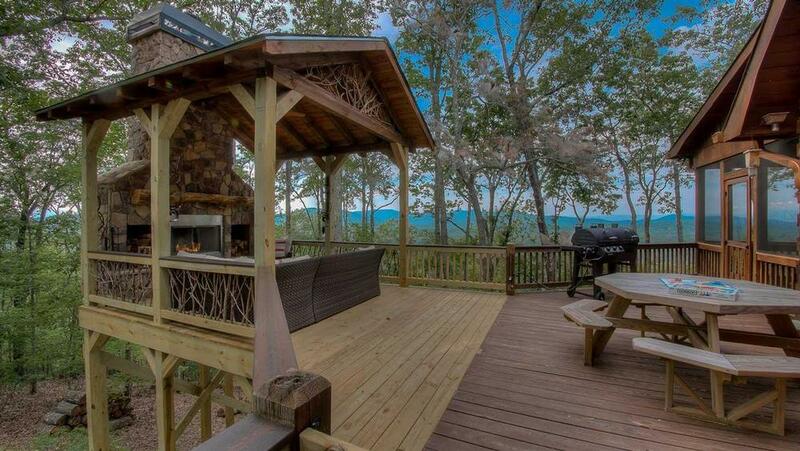 Then, you can warm yourself by the fire pit or fire up the gas grill and dine under the stars. 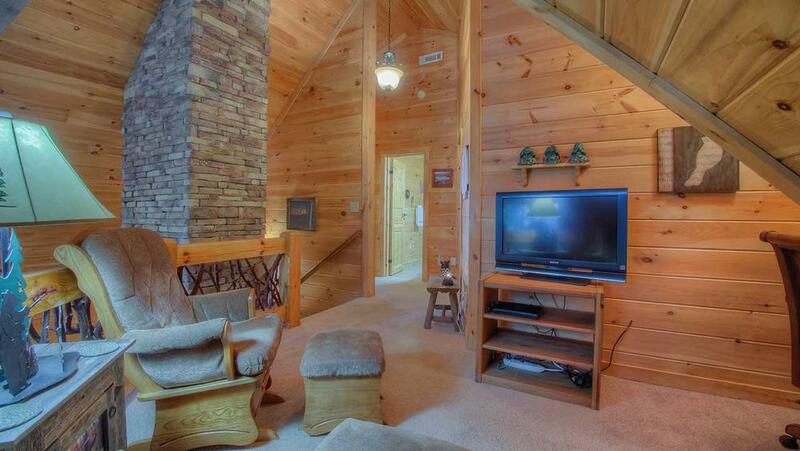 Sunshine Mountain’s other amenities include a laundry in the basement and driveway. But its most important asset is the way it will make you feel: refreshed, relaxed and happy. It’s a feeling that will linger in your memory long after you leave! 01/19 - The house was very clean and comfortable and very well stocked. 01/19 - The house is absolutely beautiful. So relaxing. 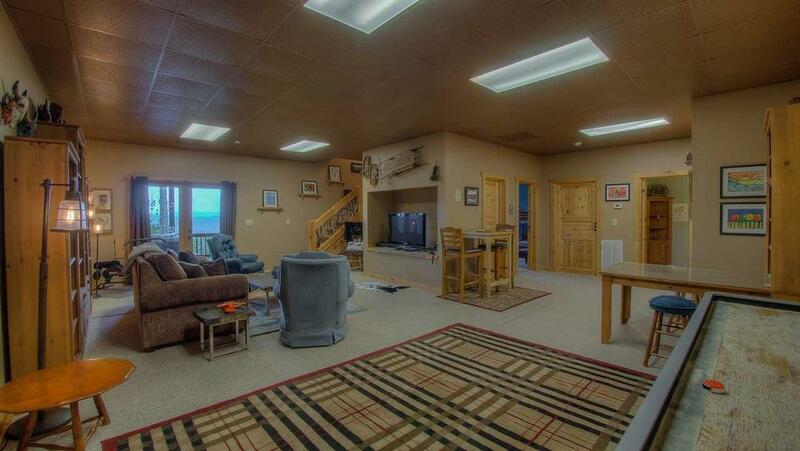 The house is decorated so nicely and has everything you could possibly need. Very professional staff and are there to answer any questions. 01/19 - The kitchen was very well stocked. 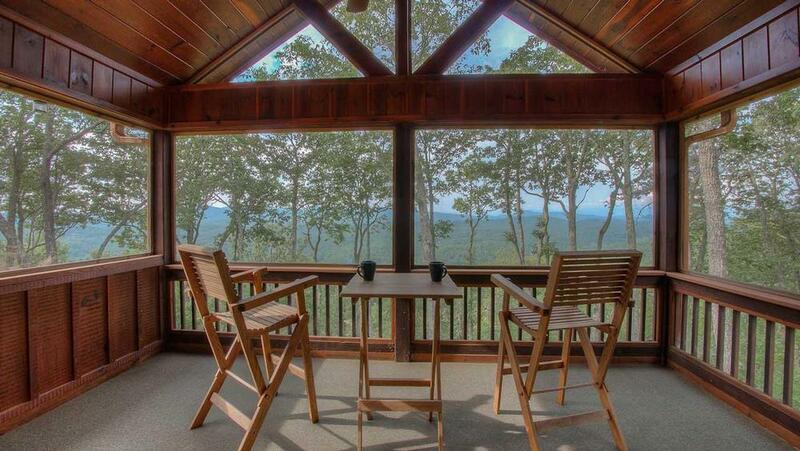 The screened porch was used frequently for morning coffee talks and the views. Great space! 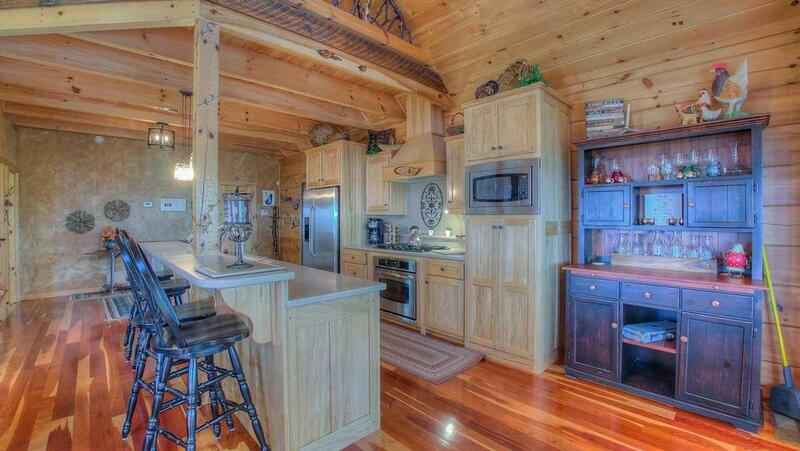 Overall the cabin was well kept. The staff was very friendly as well. 12/18 - Can't put into words how pleased we were with this house. When we arrived 2 days before Christmas there was already a lit decorated Christmas tree in the house. Everything was stocked perfectly. The house was clean. 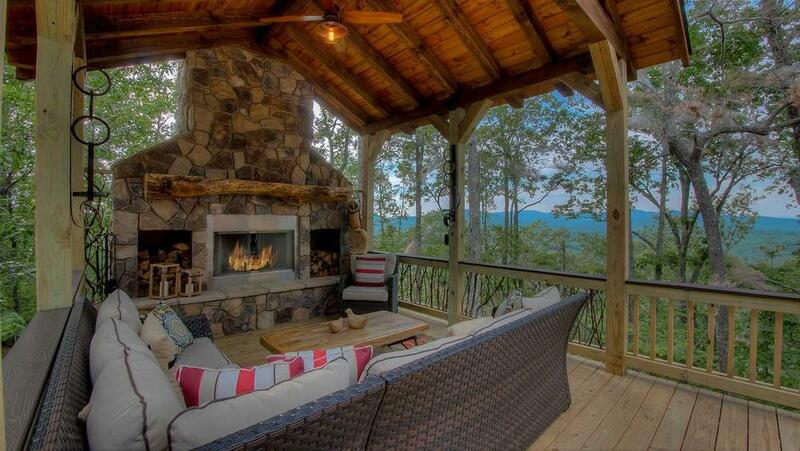 The view simply cannot be any better than the view from this home. My family and the family with us and the kids were just amazed at how wonderful this house was. We cannot wait to come back. 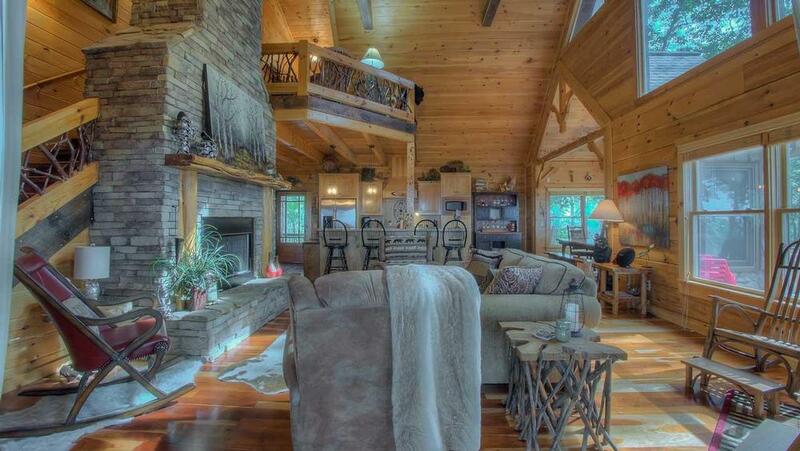 This will be the house we stay at. The attention to detail was great. Corn to feed the deer, extra bird seed, extra gas canisters for the outdoor heater. Plenty of firewood. 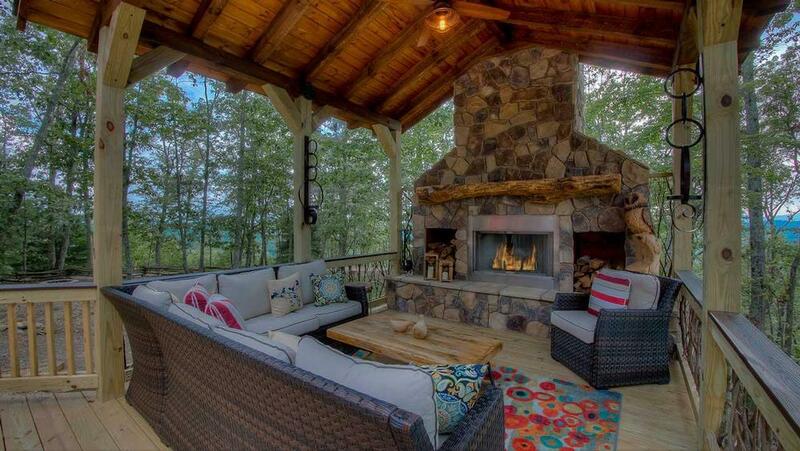 Absolutely perfect! Very good company, great communication. Easy to work with. 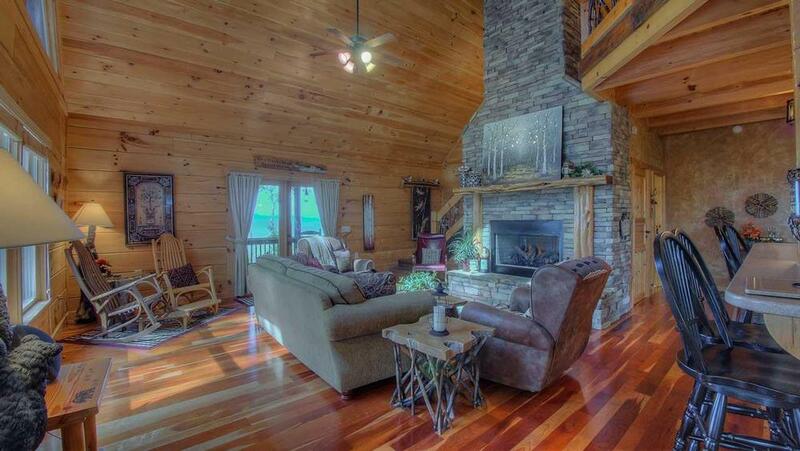 12/18 - The house was well appointed with everything you need for a relaxing vacation. There were tons of games and movies to watch. Even a big trash can filled with food to feed the deer. 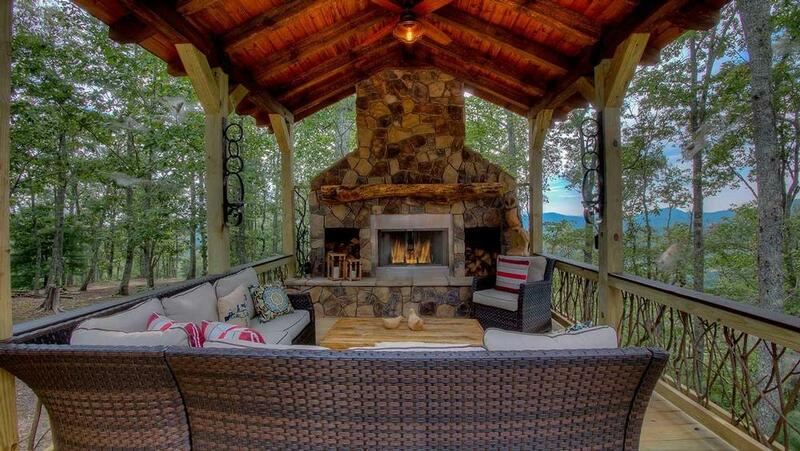 We enjoyed sitting outside by the fireplace and being close to nature. 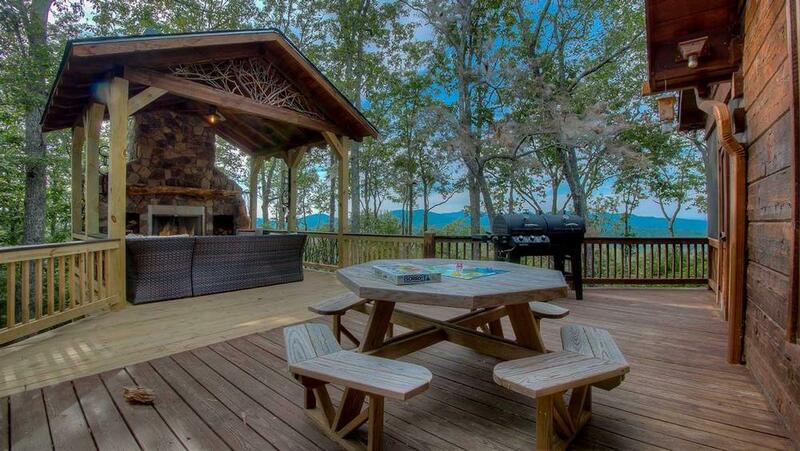 We have rented a few times with Escape to Blue Ridge and have always enjoyed our time. 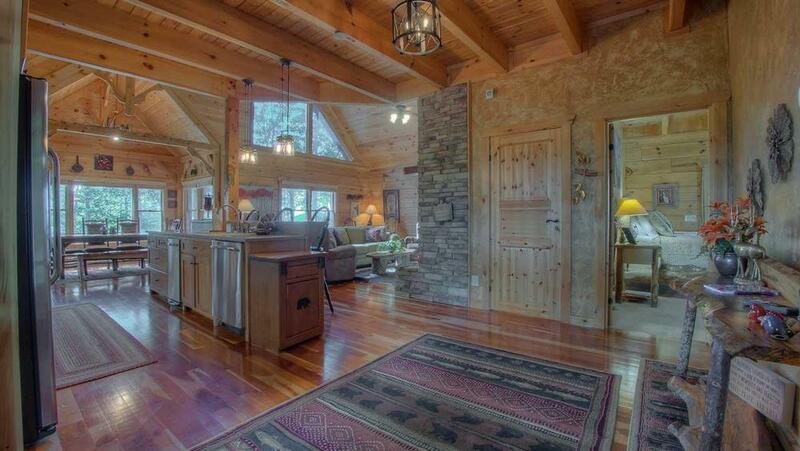 The homes are always clean and well appointed. 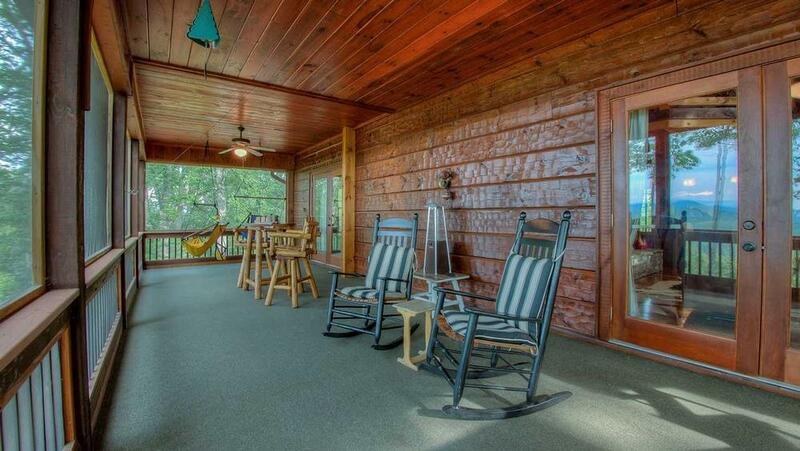 06/18 - Liked the size of the cabin, both porches and the swings. 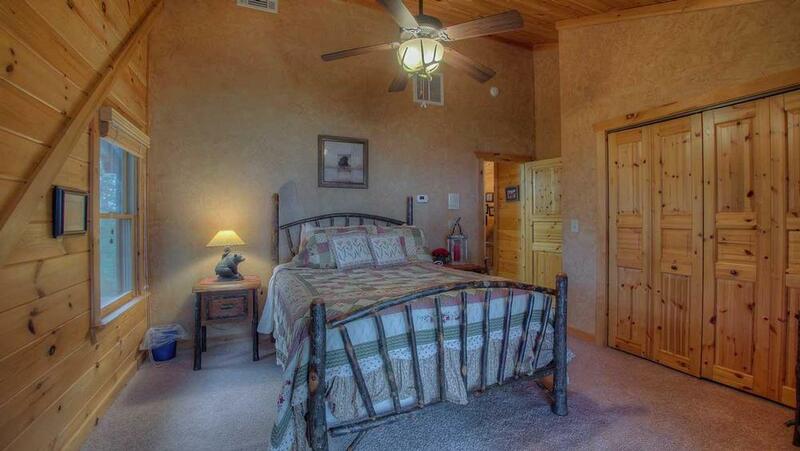 11/16- Cozy master bedroom, the basement is comfortable with a variety of entertainment. The view is gorgeous! 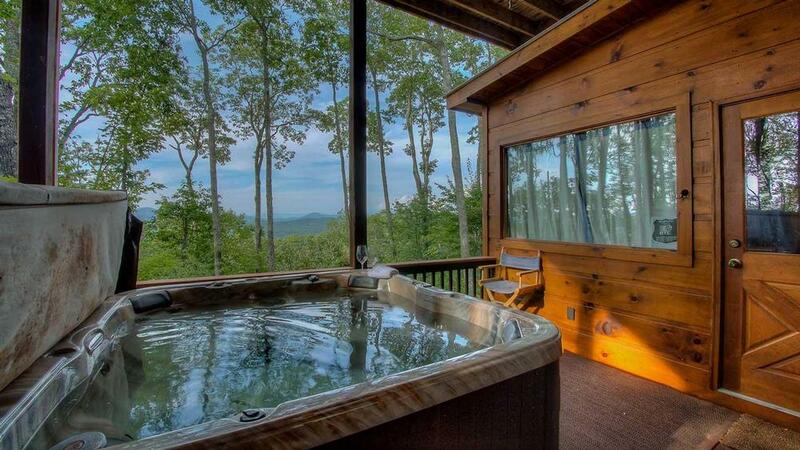 10/16- The views were nice, and the place was well appointed. Nice job! 10/16- We absolutely loved the view! It was breathtaking and all that we had hoped for. I thought the company did a great job of preparing the cabin. 03/16- The View ! Once we made it up the hill it was great! The road was difficult but worth the adventure. The company was very helpful in directing us. 01/16- The view is fantastic. 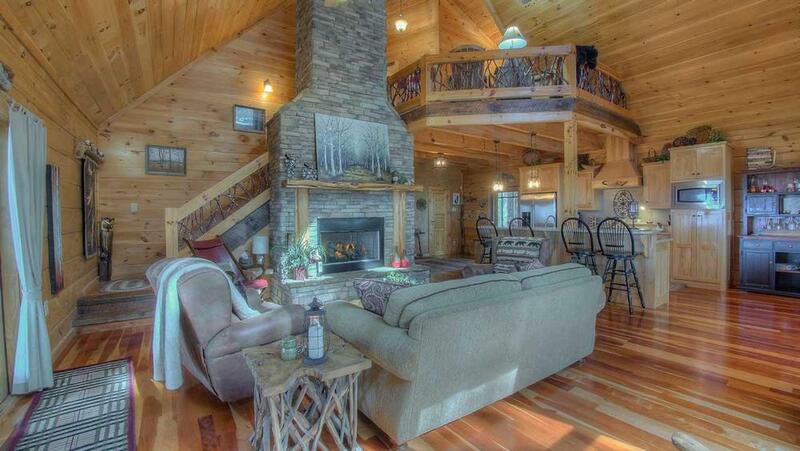 The house is gorgeous. The layout provides privacy but lots of common space that is open and inviting. We love, love, loved this place! The people at Escape to Blue Ridge are the best! 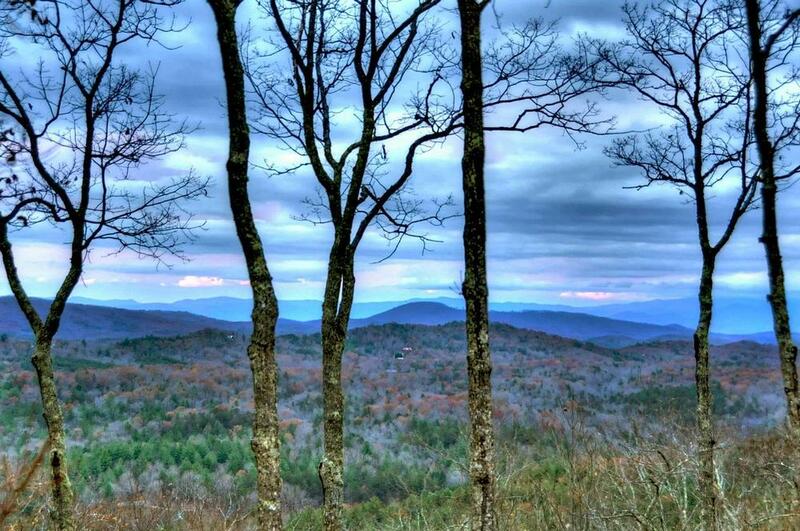 I have rented mountain cabins from three other companies in the past but from now on my first stop will always be Escape to Blue Ridge.